After a mild illness and a whole lot of work, I’m back! We will be bringing you reviews of Christmas-themed horror films and novels (be sure to check out our recent podcast) as the holidays draw near. But also, since 2016 is almost dead, it seems fitting to feature discussion of all things related to necrophilia. OK, it’s a bit self-serving as the book to which I contributed, Understanding Necrophilia: A Global Multidisciplinary Approach , is now in print. 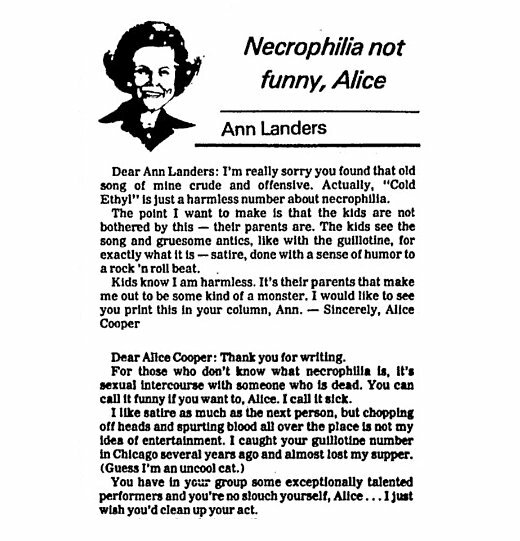 Come back tomorrow for a review of that book, but in the meantime, do you remember that time Alice Cooper and Ann Landers had an argument about his song “Cold Ethyl,” with Landers titling her column with the rebuke, “Necrophilia not funny, Alice”? …Let’s agree to disagree, Ann. Landers issues her complaint a few years after “Cold Ethyl” appeared on Cooper’s solo debut Welcome To My Nightmare . And it was not the first time Cooper recorded a song about necrophilia. “I Love the Dead” (performed live in the video below) was featured in the band’s 1973 album Billion Dollar Babies .